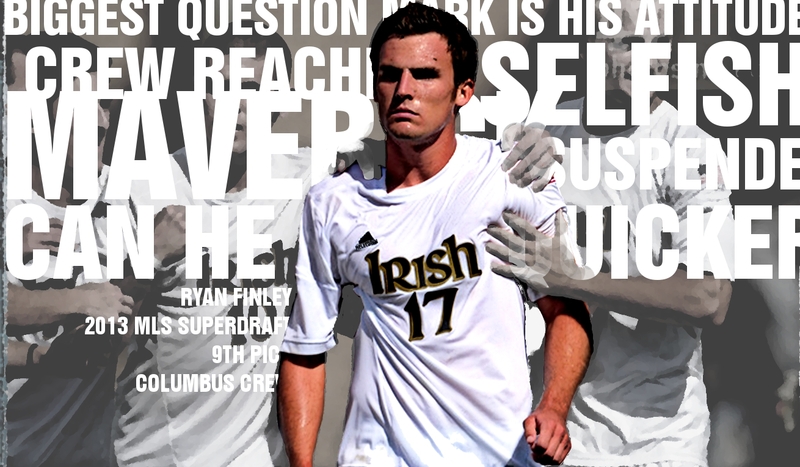 The Crew drafted Ryan Finley 9th overall in Thursday's MLS 'super draft'. Looking at his measurables he is definitely a top 15 pick but looking around at post draft grades there seems to be some missing gaps. Top Drawer Soccer: "...Finley who has a burst of pace, but [The Crew] may have reached..."
WV Hooligan: "Finley is a solid player at number nine but I do still have question marks about him." MLS Soccer: "[Warzycha] also tends to run a tight ship discipline-wise, yet he gambled his first-round pick on Ryan Finley, this rookie crop’s most prominent maverick." Ah. A question many ask Duke students. Well, with Finley we know he played there a couple years and was on his way to a Generation Adidas contract but was suspended a couple games at the tail end of his sophomore season. He then transferred to Notre Dame - but no concrete reasons behind the suspension or why he transferred. We'll never really know. It's Duke and, well... Notre Dame. With that in mind, my seemingly endless five minute investigation ended. "What scouts say," type thing exists over at the MLS site. Walking through these it appears that most were written by each player's respective college coach or staff member. With Finley's scouting report words like "cheeky" and "tad bit" are there which leads me to believe it was written by his coach, Bobby Clark. A Scot. Not exactly a bunch that holds things back. Reading through Ryan Finley's italicized summary I found myself liking the kid because of his faults. A lot. I like this. He should have one, he's a forward. Good. He's a goal scorer. Bad attitude and selfish are ingredients 1 and 2. So, speed questions. I've watched what I could on him. He looks a little slow but so are most defenders in MLS. He's got the size that he'll need against big MLS defenders. The creativity is the unknown. He'll fit right in with Jairo Arrieta and Federico Higuain then (hardy har). 5. Not at his best when he's involved in build-up play. Ever watched a MLS game between two mid-table clubs? Build-up? Alright already. Got it. 5. and 5a. match up with 1. and 2. OKAY. This one needs to be fixed. Robert Warzycha has a history of loving this type player. He was picked in the top 10 so he will get at least a 500-1000 minute type look. If so, I expect him to bank a goal or two. Warzycha's face after each should be priceless. This post started out has as something more formal but it got a little loose. Head over to Massive Report for more information on Ryan Finley and his selection during the 2013 MLS SuperDraft. Not looking to sort out hero / anti hero stuff over there. I should have more presentable type-ish information on Finley, Beckie and other new Crew players there soon.